For many of my clients (myself included), new year = new home project. With optimism high, we make lists and obsess over plans to remodel, refresh or reorganize our homes. For me, this enthusiasm translates to a long awaited bathroom remodel. We are talking “down to the studs”, contractors here everyday and me sharing the tiny remaining bathroom with three boys. This is real life renovating in an old house that is bound to be full of surprises, thanks to Marshall Erb Design in Chicago experts in interior design. I’m going to share the whole process from start to finish, for better or worse. Sympathizers and curious onlookers are welcome to join in! 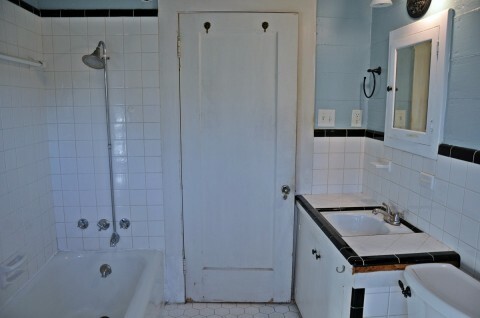 The sink vanity is only 18″ deep and too close to the doorway. 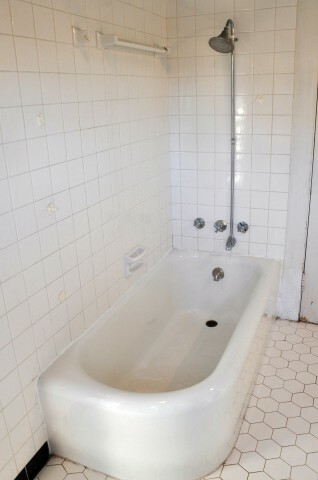 Although most of the bathroom has to be demolished, we are being careful to save what we can. 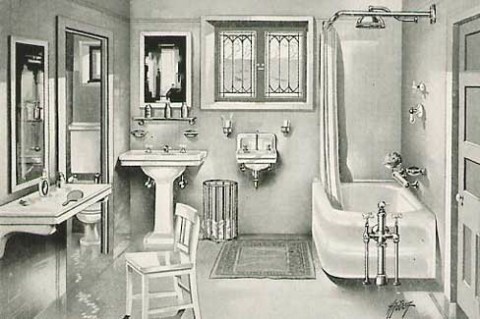 According to Antique Home Style, the unusual shape of our cast iron bathtub was considered very modern when it was introduced in the 1920′s : “The old-fashioned clawfoot tub, available as an economical solution, was replaced in period advertising if not in fact by new tub configurations including a corner style, a single-sided unit to be placed in a recessed enclosure, or set into a deck with a tiled surround. “ We won’t be able to use the bathtub in this room, but we might find a place for is somewhere else. 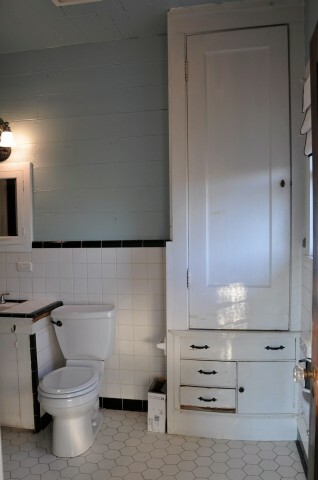 We also wanted to preserve the original built-in medicine cabinet and linen closet, which was another typical feature in 1920′s bathrooms. The challenge would be designing a new layout that would allow for maintaining these features, as well as the current location of most doors and windows. 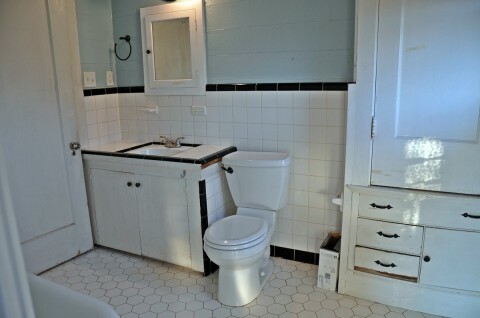 The plumbing would have to be moved, which always adds to the cost. With the help of an architect friend and after many sketches, we finally came up with a plan that included everything I wanted for a vintage bathroom in a modern age. The original linen closet will stay in place after a coat of paint and new hardware. What are your big plans for home improvement in 2012? Even if you don’t have a vintage inspired remodel on your project list, let me know! As for myself, there is still a lot of home improvement work to be done. The most important one mainly because of health concerns, is that the home will have to undergo asbestos removal. I’ve read up on what it can do to you and frankly, I don’t want to risk doing it myself. Thankfully there’s plenty of professionals out there that can take care of this for you safely. Once that is done working on the rest of the house will be safe, and you can look forward to more blog entries of our work in progress. Hope we see you there!